Click the "Window" menu label at the top of the main window. Select this command to save your current window layout. The layout can be saved to any location, and you can specify whatever file name you'd like. After saving the window layout file, the file will be added to the "Recent Layouts" submenu, for quick access. Select this command to load a previously saved window layout. The current layout will be replaced with the layout defined in the loaded file. After loading a window layout file, the file will be added to the "Recent Layouts" submenu, for quick access. Several pre-generated layout presets are included. These can be selected using the Window Layout Presets submenu. The Configuration Wizard also enables one of these presets to be selected the first time the program runs. 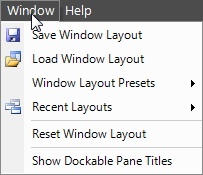 Recently saved or loaded window layouts will be added to the Recent Layouts submenu. The most recent file will be located at the top of the list. To quickly switch to a previous layout, you can select it from the list instead of using the "Load Window Layout" command. You can also use the keyboard shortcuts (Alt+1, Alt+2, Alt+3, etc.) to quickly switch between layouts. For example, if there are 2 layouts you'd like to switch between, in the first and second positions of the menu, you can toggle between the two layouts by using the Alt+2 keyboard shortcut. This command will reset any customizations you've made to the window pane sizes and locations. All panes will be restored to their initial default locations. Tab positions in the Calendar View will also be reset. This does not delete previously saved layouts, it just sets the current layout to the initial default. This toggles the display of title bars for the dockable panes of the main window, such as the Navigation Pane, Calendar Items, and Details Pane. These title bars can be used to change the docking position of the panes, make the panes float (not docked), or have them automatically hide when the mouse is moved away from a pane. After you're satisfied with your customizations to the main window, you can uncheck the "Show Dockable Pane Titles" option to remove the pane title bars, which will provide slightly more space for other items to display.